Recently I decided I wanted a pair of thick, ponte knit leggings to wear as pants; this revelation was brought about after I wore regular leggings under a thin and exceedingly short white dress and spent the day feeling somewhat exposed. I tracked these down at Westfield Mall, and they're perfect: they have a zipper and button fly, and real pockets. They are completely, 100% opaque. By any definition they're pants. And yet. That's right, I felt somewhat exposed. Don't get me wrong, I love the way this outfit looked, and I'd certainly wear it again. But the form-fitting stretchy pants combined with sky-high heels made me feel a bit Peggy Bundy for my current comfort level. That's ok; comfort levels can be adjusted. But until I get used to these, I think I'll stick to wearing them with upper layers that are a little longer. In fact, the short white dress will be just the thing. Speaking of Peggy Bundy, I have a good story about her. 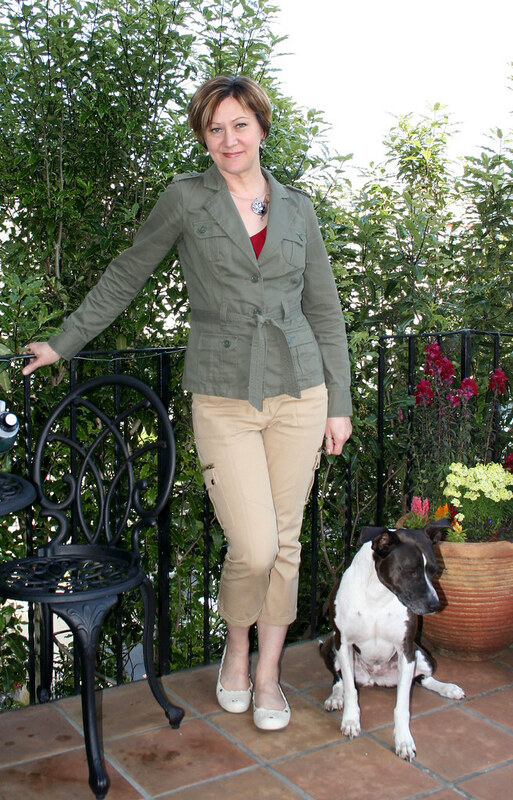 A couple of years ago Mark and I were in a shop on Haight Street looking at steampunk/Burning Man-style clothes; I was trying on a gorgeous but pricey vest and another shopper paused to tell me how great it looked on me. The shopper was none other than Katey Sagal, who of course played Peggy Bundy. Obviously, I bought the vest! In other news, I walked into the Michael Kors store while I was in the mall and fell head over heels for this gorgeous navy blue bag. Along with yet another bag that'll make its appearance in a couple days, that's 3 new ones this year. Normally I'm much more of a shoe gal than a bag gal, because few bags really move me the way shoes do; in fact, I've sometimes gone 2-3 years without buying a new bag. So when I see one that really rocks my world, I snap it up. I wore this outfit for the last day of conferencing, because as soon as the conference was over I was going directly to meet Laura in the Tenderloin neighborhood, which is close to the conference venue, for drinks and a show. Since it was the last day of the conference I didn't mind dressing on the casual side, and I needed something that was comfortable enough to wear all day and into the night. My sequin blazer gave the outfit a touch of glam while still being easy to wear. The blazer has a shrunken appearance and is cropped short in the back, giving it a tailored look even though the fabric underneath the sequins is a stretchy jersey. My only gripe is that it buttons a little high for my long torso; I think the next time I go to my dry cleaner/tailor I might have them add a lower buttonhole and move the single button down a few inches so that I can button it closer to my natural waist. The show was terrible, by the way. The band featured local hero Mike Patton, who Laura and I have seen in all of his incarnations every time he plays in town, starting waaaay back in the 90's when he was the front man for Faith No More. This permutation was mostly screaming and atonal banging on the piano, which was frustrating because the man has an incredible singing voice that he simply opted not to use. Maybe 10 years from now I'll get what he was trying to do, but here in 2011 we just left early and called it a night. It's a long weekend here in the States, so I'll be taking the day off on Monday. To get your weekend started right, let me leave you with a catchy tune from great artist I've recently discovered, from France by way of Japan. Last year some close friends went home to Lyon for the summer and brought me back a mix CD of French hits. My favorite track by far was called Je Veux by gypsy-jazz artist Zaz. Fast forward to last month, when Laura returned from a trip to Osaka bringing me a great CD she had found at the listening station at Tower Records (yes, they still exist in Japan!). You guessed it, Zaz. 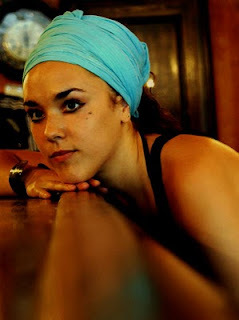 click the photo of Zaz to go to the YouTube link. I would never make any comparison to Edith Piaf lightly, but Zaz really earns that distinction. I'd actually describe her voice as a cross between Edith Piaf's plaintive vibrato and Eartha Kitt's sultry purr. She's also no neophyte, having been a singer for many years and just recently finding more widespread success in her 30's. Je Veux was her big hit last summer, but another of my favorite songs from the CD is Prends Garde à Ta Langue; I couldn't find an official video for it, but click below to listen. Happy weekend, everyone! 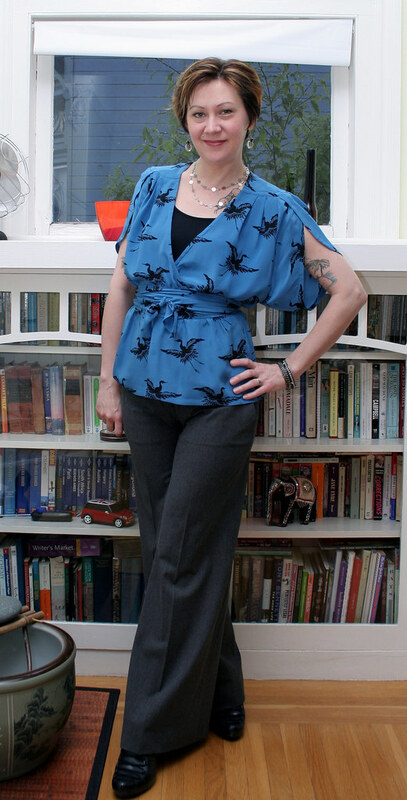 Well, I warned you that these cropped pants would be, er, cropping up again soon. A weekend had intervened after the last wearing of them, I was at a different conference, and since aside from me there was virtually no overlap in attendance among my colleagues, I figured no one would be the wiser if I wore them again. This time I paired them with an equestrian styled blazer and leopard print blouse. The open-top shoes with bare feet proved to be the absolute wrong thing to wear for the soggy day it turned out to be, but other than that it was a great semi-professional outfit to wear on the first day of a conference. I feel like red shoes would've looked better with this outfit, but I was lacking the correct red shoes to do the job, so I stuck with taupe. I did go with red earrings though. For day 2 of conferencing I figured I couldn't go wrong with my Helmut Lang blazer. Originally I intended to wear this blazer with the All Saints dress I posted yesterday, but sadly the proportions aren't right; the blazer is just a little too long in front for the dress. Thankfully these cropped pants had just arrived via Gilt, and the sunny weather that day offered the perfect chance to try them out. They're really comfortable, and the pale beige color means they match my skin tone and thus don't shorten my legs. Expect to see a lot more of these pants -- and surprisingly soon, too. If I look extra happy here, it's for two reasons: Jess was in town, and I was spending my workday in San Francisco. If it isn't already obvious, let me just state for the record that I am giddy with love for the city I live in. It never gets old for me; all the interesting things to do, amazing restaurants to try out, beautiful scenery, and most of all the people. Not a day goes by that I'm not filled with pride and gratitude to be a part of this unique and special place. I love it SO MUCH!! Ahem. As I was saying... After I got home from the conference, I dressed the outfit down by swapping out my jacket, shoes, and necklace. Georgie was there to supervise. I recently attended two back-to-back scientific conferences in San Francisco, which was such a treat. Conference #1 was on a Thursday and Friday and Conference #2 was the following Monday - Wednesday; 5 straight business days of getting to live my dream of essentially never leaving the city limits except for personal reasons such as travel or visiting friends. Why would I ever want to leave when everything I need is right here? Everything's waiting for me! The last time I got to live and work in San Francisco was in 1992; I worked at a photo lab downtown, and although my bosses were two of the most horrible people I've ever had the misfortune to meet, I still got a thrill every day out of taking the subway downtown and being in the midst of city life. 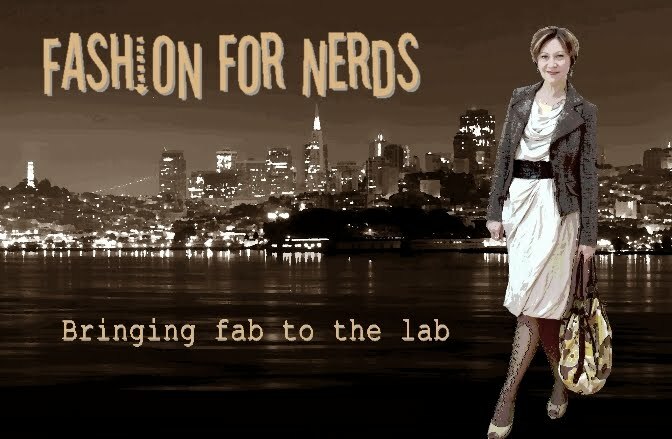 I always thought it would be cool to be one of those well-dressed professional women, with their blazers and heels and stylish handbags, because obviously, working with chemicals in a photo lab didn't really lend itself to wearing nice clothes. When I attend conferences in town, I feel like I've finally become one of those women. 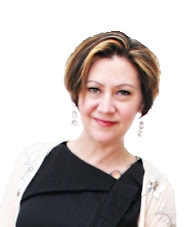 This All Saints dress was just the perfect thing to wear to a conference, because it has many of the interesting details that are key elements of my style, while still offering a tailored and elegant look. 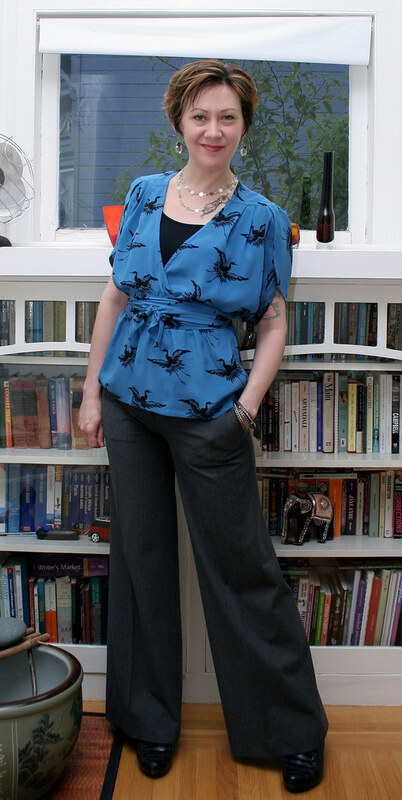 Conferences are great opportunities for networking, so I generally dress a little more professionally for them than I do for my usual kooky office looks. For what purpose I might wish to network at an industry conference I'll leave it to you to guess. Shhh... just don't tell my boss. Well it's spring, and right now it's also cold. 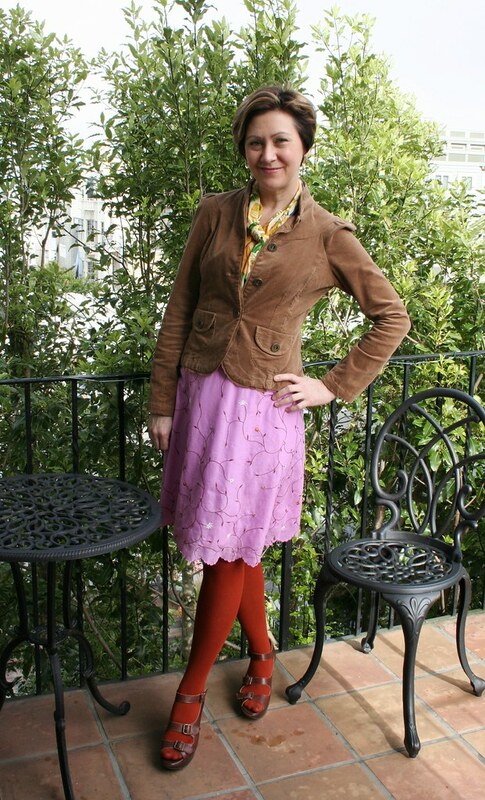 Clearly this makes dressing in a springy way very challenging, so for this outfit I simply deployed as much color as I could possibly pile on. 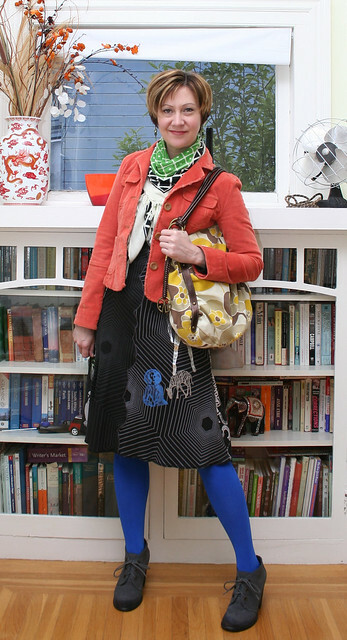 Electric blue legs, green scarf, orange jacket, yellow bag. When you're this covered up, the best you can do is to cover yourself with color. Sal sent this Karen Kane dress along to me after deciding it didn't work for her figure. And although I'm convinced it would've looked fab on her, I'm also not one to look a gift horse in the mouth. And let me tell you, I absolutely LOVE this dress. 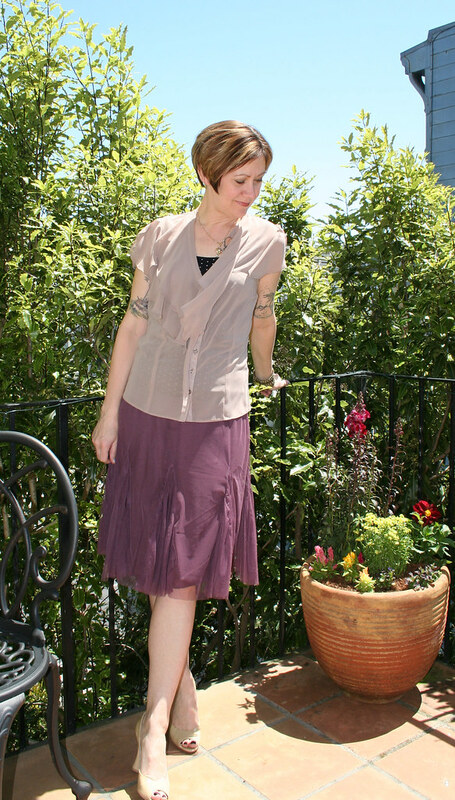 Thick, bouncy, double-layered jersey gives this dress a heft and drape that is luxuriously comfortable and also substantial enough to stand up to the windiest Bay Area weather. I can already tell that this dress with a lightweight jacket, bare legs, and sandals is going to be a staple for summer weekends. I wore the outfit with the jacket all day at work, but I thought I'd also show the dress by itself so you can get a look at the whole thing. Needless to say, the asymmetrical hemline is a big plus for me. If only the weather still looked like this; it's gotten cold and rainy since these photos were taken. But as you can see from the last several outfits, I took full advantage of the stretch of warm weather and bared my legs, arms and feet. It was Sandals Week in the Bay Area. In keeping with my new seasonally-appropriate dressing policy, my plan for this spring and summer is to wear the crap out of all my sandals, even on days where it might be a little on the chilly side. Then when the weather turns colder I'll pack them up in a box and store them out of sight, just as I recently did with all my heavy sweaters, woolen items, and insulated boots. That way I won't have to spend half the year looking wistfully at all those pretty shoes and being sorry I can't wear them. I bought this dress from the All Saints website months ago, but when it arrived it still had the security tag on it. And since the brick-and-mortar All Saints store is down by Union Square, and since I HATE going to Union Square, it took awhile before I summoned up the motivation to go down there and have them remove the tag for me. But here's the dress at last; it's the same Layla dress style I've been eying since 2009, which I guess explains why I didn't mind waiting a couple more months to wear it. 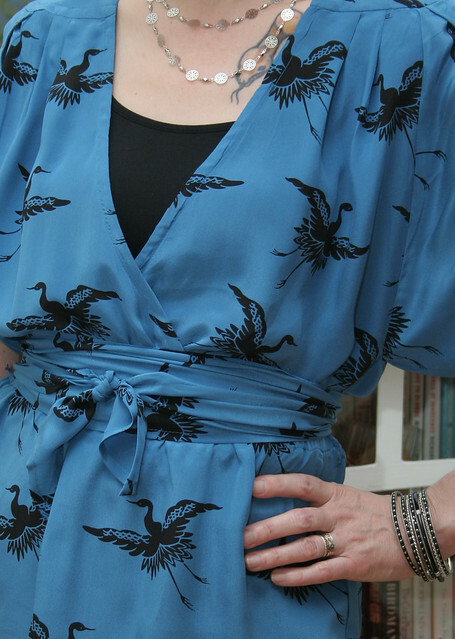 I initially fell for this dress in the blue color, but in the end I decided I liked it even better in oyster, which to me makes it more wearable as a day dress. I also liked it a LOT better on sale for $159, versus the $305 it was when I first found it. Patience finally paid off. 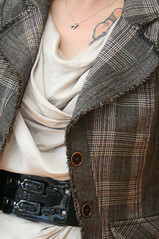 The little cardigan/shrug is also from All Saints. 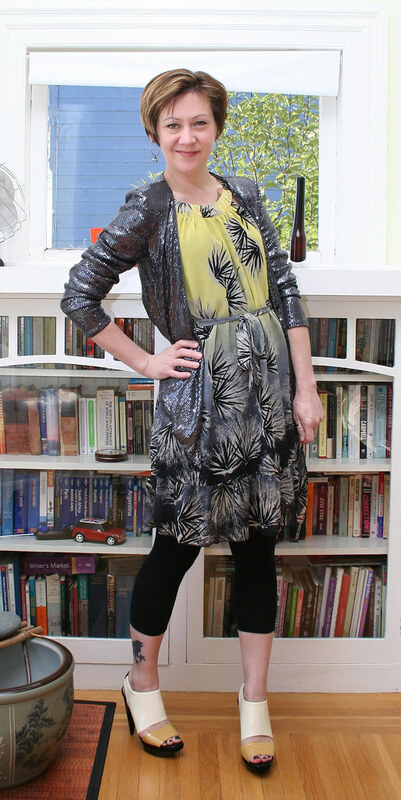 The sequins are actually all made of solid metal, which gives this piece a nice weight and drape. I just loved the way the soft cream, yellow and black of these platform sandals matched so perfectly with the pattern of this skirt. It was another one of those serendipitous wardrobe convergences; I didn't buy the shoes to go specifically with the skirt, but it happily worked out that way. Blogger had some issues last week and seems to have eaten a bunch of comments, so I apologize if yours was deleted. I've done a bit of gardening recently; this pot of flowers is one of the last projects. Between this and our new hummingbird feeder, our patio is now swarming with hummingbirds, all trying to defend their favorite new feeding spot. I can't wait to see what happens when Georgie gets too close to these flowers. I suspect she'll go skittering inside when she realizes that hummingbirds, despite their diminutive size, will not be intimidated by larger animals. The color of this top was described as "mink," but to me it looks like more of a soft purple. I love the movement of the ruffles when the breeze picks up. This skirt (and the other ones I have in different colors) is truly an all-season one; during the cooler months it's an excellent layer beneath another skirt or a dress, and now that it's warming up again I'm looking forward to wearing it more on its own. The dusty purple color also transitions well from one season to another. 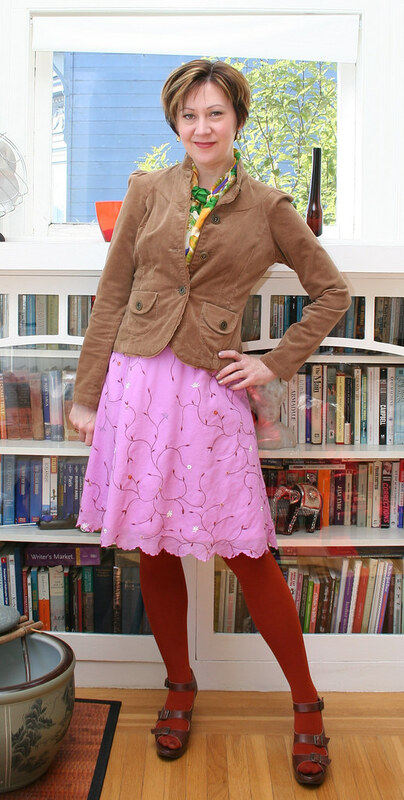 This is the sort of outfit I envisioned when I bought this big cocoon-cardigan, because even the warmest days in SF are rarely warm enough for a dress like this all on its own. The cardigan is a tissue-thin slub knit fabric, which is great for adding just a tiny amount of warmth without being too heavy. On a breezy day it also flies out behind me like a cape; perfect for those times when I need to pretend I'm a superhero. What would my super power be, you might ask? I would be the Translator, able to speak any language fluently so that I could show up to help hapless travelers who are trying to find their way or just get to a bathroom. That's way more useful than having x-ray vision any day. I also thought I'd include a wider angle shot of this corner of the house, because I finally got this window ledge looking the way I want it to, after many unsuccessful attempts at decorating it. Not only that, but I finally got Mark to move the half-assembled fountain that's been sitting in the corner for nearly a year -- which is now sitting, half assembled, where the vase used to be. It's slow progress, but at least it's progress. This outfit is sort of a repeat, as I've worn this dress/tights/shoes combo a couple times before, but the colors just go so well together that whenever I pull this dress out I'm stumped to come up with a better formula. Sometimes there's just no messing with a good thing. Since the middle panel of this dress is a see-through lace mesh, I always need to cover the midriff in order to wear it to work. 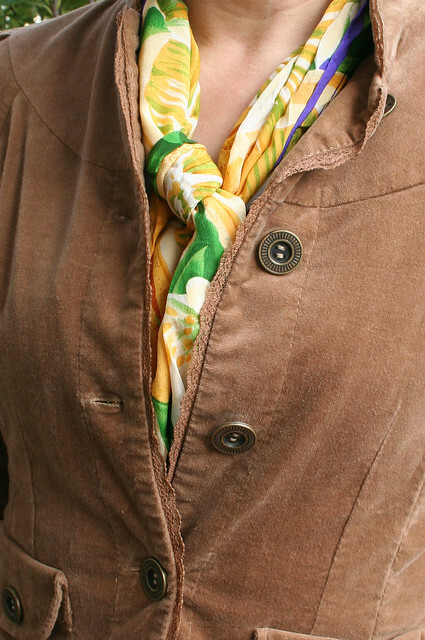 This time I used the blazer to cover most of it, and filled in the rest with the scarf. 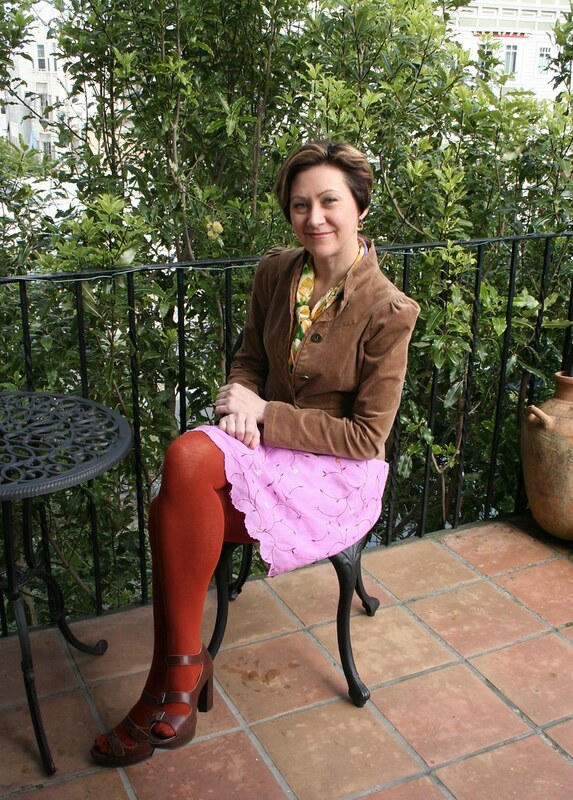 It was fairly cool that day, so the velvet blazer and tights kept me warm, while the sandals and bright colors made it seasonally appropriate. The outdoor location is the patio just off our dining room (which really isn't a dining room so much as a hatmaking studio). You've actually seen this location before, but it was with the ugly blue building next door in the background. I much prefer this angle. Kimberly inspired me to put together this outfit after her post about red blazers a couple of weeks ago. I figured since the outfit looked so summery, I'd also show you the sunglasses I picked up for a mere 10 bucks at Century 21 while Sal and I were in New York. I love high quality, stylish sunnies, but I tend to be hard on them, so finding a great deal is important for me. For $10 I won't be heartbroken if these get scratched or I accidentally sit on them. I spotted this sequined blazer in the window of a local boutique while I was riding the bus, and knew it needed to be mine. 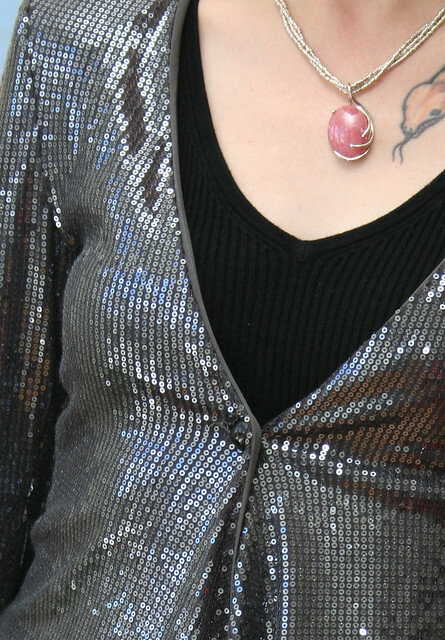 I've looked at many a black sequined blazer over the last year or so, but they've all been a bit too cabaret for my comfort level; somehow the dark silver sequins work better for me as part of a daytime ensemble. For this outfit I left the blazer open for a more casual look. It fastens at the center with a single button, which makes the front tails drape down softly to a single point in the middle. I think the relaxed structure of the blazer, which drapes rather than having any structured or boxy tailoring, also adds to its casual vibe. Congratulations! I'll be in touch shortly. This blue kimono-style top is another recent purchase from the Asos sale. As soon as I saw it I thought of 1940's style sailor-inspired outfits with wide-legged trousers and wrap tops. So for its first outing I duplicated the look using these wide-legged pants, which are ordinarily more of a winter item but which I thought worked beautifully here. It was one of those cool, rainy spring days with a cloudy sky, which meant that my perfectly coordinated umbrella really came in handy. 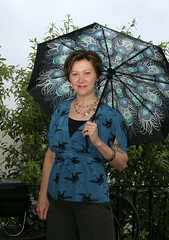 And no, I didn't buy the top to match the umbrella, but sometimes things just seem to work out that way for me. If you'd seen the listing for this black top on the Asos website, you might have taken one look at the cropped length and bare midriff shown in the photos and immediately passed it by. And ordinarily, so would I. But as it turned out I had also just added this white dress to my cart, and this top immediately struck me as something I could wear with it. As much as I love the clean look of optic white, it doesn't look great near my face. So I bought the dress knowing that I'd need to wear it with something else, because at the sale price it was a good enough deal to live with the limitation. 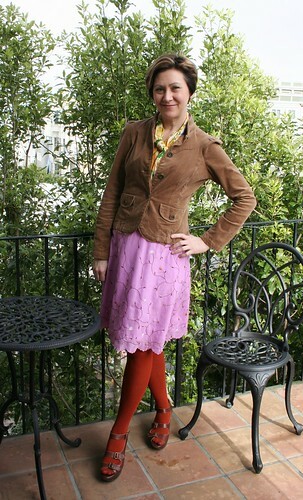 And since in San Francisco layering is a necessity for much of the year anyway, it wasn't really that big a sacrifice. The black top, which is made of t-shirt jersey in the front and sheer chiffon in the back, was perfect. With its funky dolman sleeves and asymmetrical hem, it provided an interesting, modern look and a nice sharp contrast against the white. If you look closely at the dress, you'll see that the opaque lining layer is scandalously short. For that reason I was initially dubious about wearing the dress over nothing but leggings, because it essentially amounts to wearing leggings as pants. In the end I decided I didn't care, because anything I tried to layer under the dress took away from the clean, simple lines of the outfit. And looking at it now, I feel like I was plenty covered up. 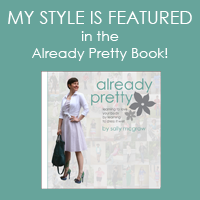 Score a victory for style over modesty.